UK staff and faculty attending a lunch and learn. LEXINGTON, Ky. (Jan. 15, 2019) — The University of Kentucky Staff Senate will host a lunch and learn with Professor John Thelin, of UK College of Education, from noon to 1 p.m. Wednesday, Feb. 6, in the E. Britt Brockman Senate Chamber in the Gatton Student Center. 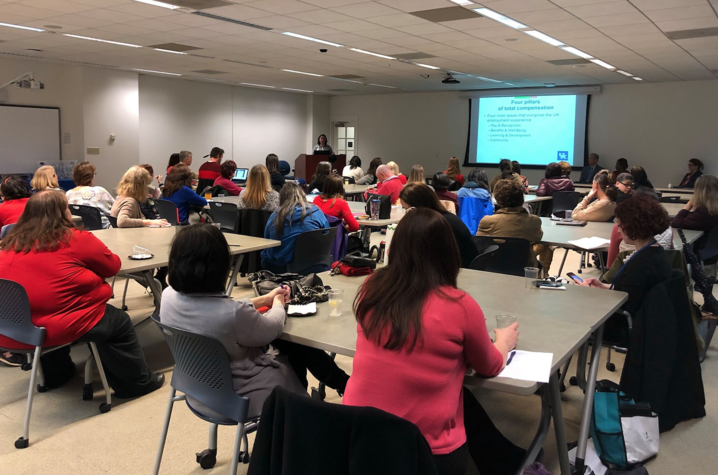 This event is one of many in a series of lunch and learns organized in an effort to better educate university employees on topics such as information technology services, parking and employee benefits. "If you've ever wondered where the university started, or what the campus used to look like, come and listen to Dr. John Thelin as he tells the story about the early days of Kentucky State College," said Jon Gent, Staff Senate chair. "He speaks with humor, energy and a passion that is absolutely contagious." Thelin's research and teaching centers around higher education and public policy. His book, "A History of American Higher Education," dives deep into the history of colleges and universities as a part of pop culture in America. Referencing his research and his novel, Thelin will discuss the historic architecture of UK, its changing landscape and the role faculty and staff play within higher education as a whole. The lunch and learn is opened to the public, to RSVP, click here. To learn more about Staff Senate and to view previous lunch and learns, visit its website.